Do you want to juice wheatgrass, kale, spinach and other healthy leafy greens but don’t know which juicer to use? Don’t pick a cheap juicer- look for the best juicer for greens that will help process your vegetables into a tasty juice. In recent years, we’ve learnt about the importance of regularly consuming leafy greens to keep our bodies healthy. But if you’ve tried a regular, cheap juicer to make kale juice, you probably know how awful the juice turns out. Most juicers chop up the leafy greens and leave you with a very thick, pulpy sludge which is so difficult to drink. And as most cheap juicers are centrifugal, it means that they rotate at such high speeds that the heat created from the juicer damages the healthy nutrients and cells of the leafy greens. There is a better option if you want to juice leafy greens such as kale, spinach and wheatgrass. Home Health Living has done some extensive research and reading and we have found the best juicer for greens. In fact, we’ve come up with a top 3 list of juicers that juice leafy greens that give you a beautifully smooth and nutrient-packed juice. 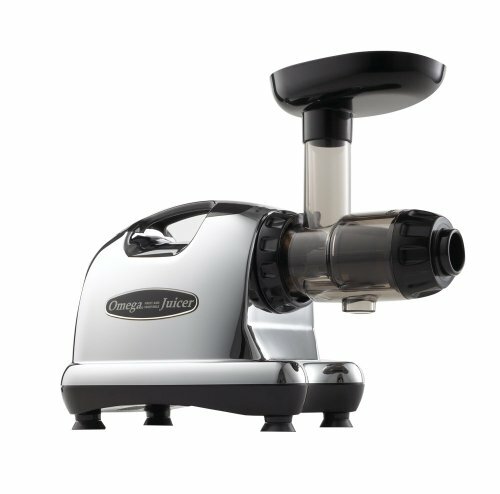 The Omega J8006 is a best-selling juicer on the market and an excellent option for juicing leafy greens. It is a masticating style juicer, which is also referred to as a slow or cold pressed juicer. This is because the gears on the juicer rotate at much lower speeds than those of a centrifugal juicer. The Omega J8006 rotates at a very low 80RPMs, which is why we have rated it in our top 3 for the best juicer for leafy greens. The low speeds protect the nutrients and vitamins found within leafy greens such as kale, spinach and wheatgrass. We also love the Omega J8006 because it keeps oxidation to a minimum due to the lower speeds. The faster the speed, the more oxygen the produce is exposed to. And when fruits and vegetables are exposed to oxygen, they lose their color and turn brown over time. The slow rotations also reduce the amount of foam and froth produced when juicing leafy greens. Your juice can be stored in your refrigerating without the quality or appearance changing much for up to 72 hours. This means that you can juice bulk quantities of leafy greens to create juice that you can take to work for a few days, without having to juice every single morning. A time saver! Another reason we recommend the Omega J8006 is because its gears, also known as augers, are high quality GE Ultem augers. This brand of augers is known for being up to 8 times stronger than most other plastic augers. This is important because weak plastic could result in damaged augers, and sometimes bits of plastic could end up in your juice. Omega has considered this when designing the J8006, hence the reason for using higher quality augers. The Omega J8006 also runs the produce through two stages during the juicing process. This helps to extract the maximum amount of juice possible. You want as much of the nutrients from the leafy green within the juice itself, not the pulp that you won’t be consuming. The first stage crushes the leafy greens to obtain the juice. The second stage involves squeezing the pulp to extract even more juice before the pulp is ejected. This dual stage process is important for juicing leafy greens because leafy greens don’t contain as much juice as other vegetables or fruits. So a dual process ensures that the Omega J8006 has worked as efficiently as possible to extract as much juice and nutrients from the leafy greens. With the Omega J8006, Omega has designed and built a high-quality juicer that works efficiently to bring you the maximum amount of juice from leafy greens. It operates quietly, and to make it even more quiet, place the juicer on a tea towel to muffle the sound a little. Click here to read more reviews and to check the latest price. 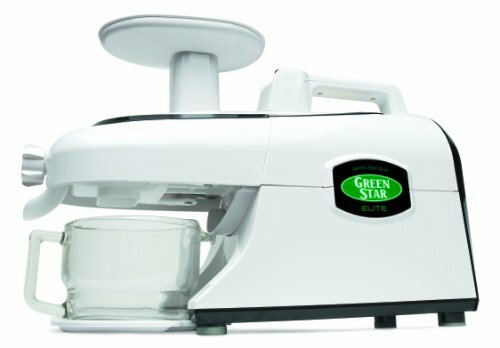 If you want the best juicer for greens, then you can’t go past the Tribest Green Star Elite GSE-5000 twin gear cold press juicer. One of the reasons we chose this for our top 3 of best juicers for greens is that it has two gears, that means that it has two augers. While this results in a higher RPM of 110 compared with the Omega J8006, the Tribest produces better quality juicers because of its juicer components and the extra functions they perform over a standard masticating juicer with only one gear. The twin augers of the Tribest Green Star Elite are made of stainless steel and have been designed in a way to allow the juicer to mimic the human function of cutting through vegetables. The augers have a sharp, teeth-like structure that have special pocket recesses that helps with juicing hard vegetables such as carrots. So if you want to mix up your leafy greens with other vegetables, you are able to do so in the most efficient way possible. The design of the twin augers also helps reduce strain on the juicer, so when it is juicing hard vegetables there is a lower risk of damaging the juicer. This leaves you with a long-lasting juicer that is well worth the money. As with the Omega J8006, the Tribest Green Star Elite reduces oxidation levels when extracting your green juice. However, it performs slightly better than the Omega J8006. This is because Tribest uses magnetic and bioceramic technology within its augers to further reduce oxidation. Another reason that we have chosen the Tribest Green Star Elite as a best juicer for greens is you can select how smooth or pulpy you want your green juice to be. Some people prefer to consume the pulp as well, to reduce food wastage. If this sounds like you, then you can use the coarse screen to give you a thicker, pulpier juice. However, if you prefer a smooth green juice without any pulp, then you could use the fine screen which will filter out the pulp for you. But don’t throw away the pulp! The Tribest Green Star Elite leaves you with a very dry pulp which is perfect to use in raw cakes and other raw or vegan recipes. There is also a homogenizing screen which allows you to use your Tribest juicer for other purposes. You can create nut butters and produce sorbets. If you have a baby, you can even use it for making baby food! How versatile is that! The Rolls Royce of juicers for greens, the Super Angel Deluxe model juicer is the best juicer for greens, other vegetables and all fruits, include soft fruits. This particular model is a new 2015-2016 model that replaces all previous models and is available in four different variations at different price points. The deluxe model is the mid-range model, one below the premium deluxe and slightly less expensive. The first thing we noticed about the Super Angel Deluxe that we just love is that it is an all-stainless steel juicer rather than using plastic components like most other juicers for leafy greens. This is fantastic as some plastics can leech chemicals into your juice. Plastic also isn’t good for the environment. But more importantly, why have we chosen the Super Angel Deluxe as a best juicer for greens? It is a versatile juicer that can create juices from almost anything, not just leafy greens. It can also juice carrots and apples which many people like to add to their leafy green juice to give it added sweetness and flavor. 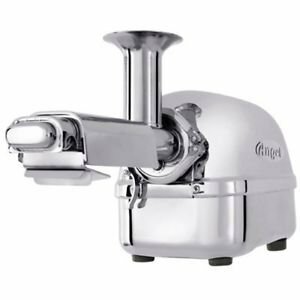 You can also use the Super Angel to create soymilk, nut butters, tofu and frozen fruit sorbets. And if you’re going to spend that much money on a juicer, you’d want it to be versatile. The Super Angel Deluxe uses a revolutionary stainless steel design that uses a twin gear impeller press system with a rotation of 82RPMs. This is a speed that is less than a twin gear masticating juicer such as the Tribest, and only slightly higher than the Omega J8006. This ideal speed gives you the maximum enzymes and nutrients in your juice from your leafy greens. The low speed also ensures that oxidation is not an issue for your extracted leafy green juice. No heat is produced, which also means less stress on the machine. Your investment in a high-quality juicer for leafy greens will give you returns on your health for many years. Another great feature is that the stainless-steel gears are antibacterial, which is important for hygiene and health purposes. We really like that you can use the Super Angel to get the most juice out of your leafy greens than any other juicer can. This is because the Super Angel uses a three-stage twin gear system. Most other masticating juicers for leafy greens use a maximum of only two stages. While this is still great, a third stage ensure a higher pure juice yield. Stage one applies pressure to the leafy greens, while stages two and three grind and process the leafy greens. This results in a super dry pulp and more green juice. There are three-stage screen filters that help to maximise the juice yield. But do all these extra juicing stages and technology mean more mess and cleaning up for you? We’re happy to tell you that the Super Angel Deluxe is a very easy to clean juicer. An efficient juicer means that more produce is used up in the juicing process- either as pure juice or dry pulp. This means less produce stuck inside the actual juicer. And do you know what that means? Less cleaning for you! What’s more, the Super Angel also features an anti-jamming system which prevents overloading of produce. There is a self-adjusting speed control to help prevent overload. There is also a cooling system within the juicer in case of possible overheating when using the juicer for long periods of time. 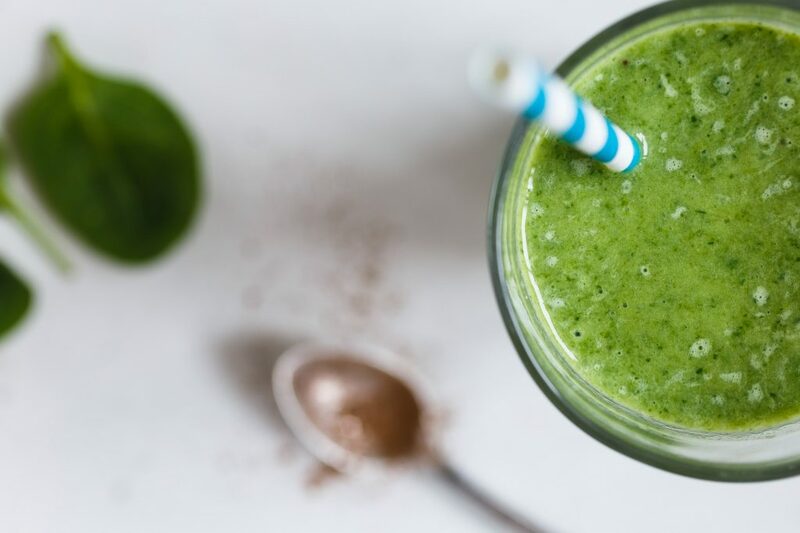 If you need to make green juice for your whole family, you can do so knowing that your machine is strong enough to be able to withstand long use. Other juicers can only operate for about 10 to 15 minutes before needing to be switched off to allow it to cool down a little. The superior quality of the Super Angel Deluxe juicer makes it a juicer that is far superior for juicing leafy greens than any other juicer on the market. Great care and workmanship has gone into designing and manufacturing the machine, which reflects in its performance. And to help you get started on your journey to making healthy juice from leafy greens, when you purchase a Super Angel Deluxe juicer, you will receive a free Juicing Bible book which features some great juice recipes. It’s important to know that there are many different types of juicers on the market, and not all of them are the same. Despite many juicer manufacturers claiming that their juicer is the best, you need to really find out the details of the juicer and know how the juicing process works. By knowing more about the juicer, you can work out whether it is the best juicer for greens. Fruits and vegetables all have different textures and there is no one-size fits all when it comes to juicing fruits and vegetables. The best juicer for wheatgrass and leafy greens would be efficient enough to extract as much juice from the leafy greens as possible without damaging the important nutrients. That’s why we have chosen our top 3 best juicer for leafy greens- they are masticating juicers that operate at lower speeds than traditional centrifugal juicers. To juice leafy greens, you need a slow juicer, which is what a masticating juicer is. 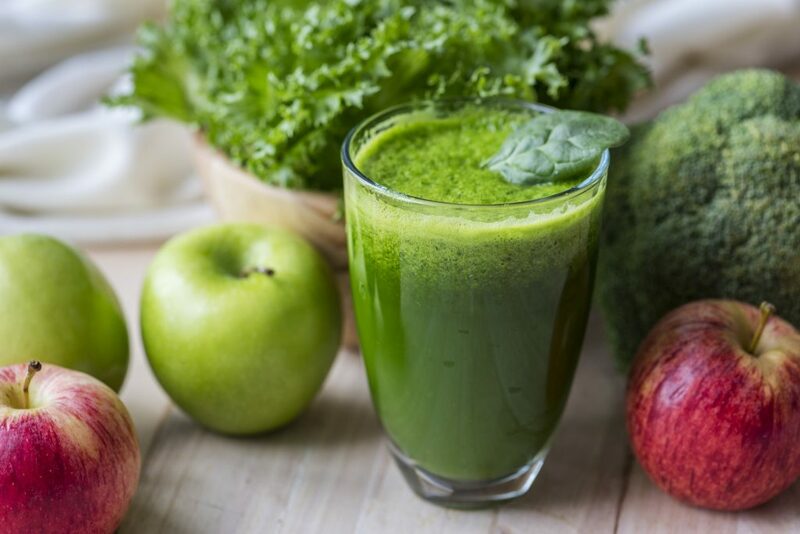 Whether you choose the Omega, Tribest or Super Angel, know that you are buying the best juicer for greens to enable you to experience the maximum health benefits from the nutrient-packed vegetables. Whether its wheatgrass, kale, spinach or other leafy green, you are getting the best juice possible. Disclaimer: This post contains affiliate links. If you make a purchase via these links, we may receive a small commission at no extra cost to you. This will help pay to keep this website operating. Thank you for supporting our family!